This is a favourite on the menu at The Happy Pear. What really makes it stand out is if you stir some of our sun-dried tomato pesto into the stew as well as putting it on top after you bake it - we highly recommend this! A topping of grated cheddar is lovely too. Heat the oil in a large pan on a low to medium heat. Add the onion and bay leaf and cook gently for about 10 minutes, stirring regularly, until the onion is soft and translucent. Add the carrots, celery, chilli and garlic and continue to cook for 6 to 8 minutes, stirring regularly and adding a splash of water if the vegetables begin to dry out. Add the leeks, green pepper, dried herbs and paprika and cook for a further 5 minutes on a medium heat, stirring regularly. Now, stir in the tomato purée, followed by the tinned tomatoes. Turn up the heat and bring to the boil, then reduce the heat to a gentle simmer. Add the chickpeas to the pan, then leave to simmer for 10 to 15 minutes. Meanwhile, steam or boil the potatoes. Add most of the parsley to the chickpea stew along with the honey. Season to taste with salt and freshly ground black pepper, then stir in 1 tablespoon of sun-dried tomato pesto. Pour the stew into a baking dish and top with the sliced potatoes, overlapping them slightly. Sprinkle with salt and drizzle with olive oil, then bake in the oven for 20 to 25 minutes, until the stew is bubbling and potatoes are crispy. 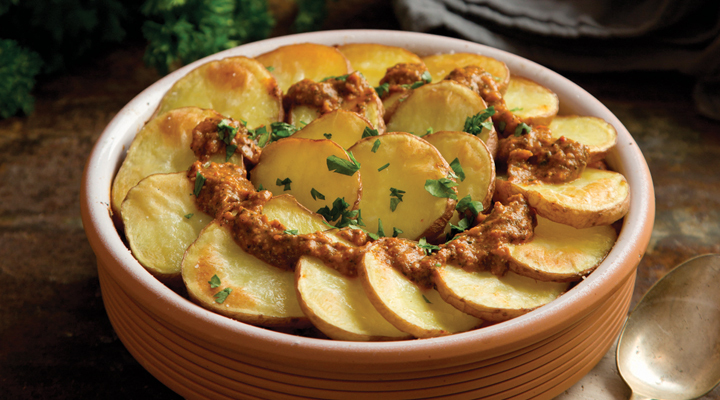 To serve, lightly spread some sun-dried tomato pesto over the potatoes and garnish with the rest of the parsley. Nice hearty dish, packed with veg of different types so felt like a full and well rounded meal. Quite a sweet taste with the puree and honey so I might skip the honey step next time. Amazing dish, flavours are fantastic. Bursting with lovely veggie flavour and consistency. So delicious. Although it took 1.5 hours from start to finish. Definitely worth the time.